Just over a year went by since my last entry, crazy! The kid has grown and another is on the way. Life moves fast now. 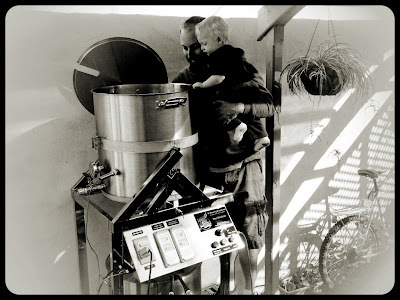 With limited time, I found that Twitter was the best medium to share my latest brewing adventures. Posting the below time lapse video of my last brew day really brought me back here. This brew was the 16th batch on the new system which has now yielded 195 gallons. On my old 5 gallon system, the same volume would have taken 39 batches. Since I started brewing with the B3 2050, I have been really enjoying splitting a batch in increments of 5 gallons to test out different yeast strains. In the future, I want to also experiment with varying fermentation temperature schedules. The video below was taken using a time lapse camera over the course of a casual homebrew day. The camera took one shot every 2 seconds and compiled the images at a rate of 30 frames per second. I edited out some of the longer waits (all grain, all day) to show more of the busy-body action of the day. For a better resolution video, you can go here Chillindamos Homebrew Time Lapse. Divded wort into 3 five gallon carboys pitched with 1 vial each of the 3 yeast strains. No starters. One minute of oxygen via diffusion stone in each carboy. Also, 1 vial of WLN4000 Clarity-Ferm in each carboy (first time use). B3 2050 BrewSculpture is Here! The new system has arrived and homebrewing has elevated to a new level. 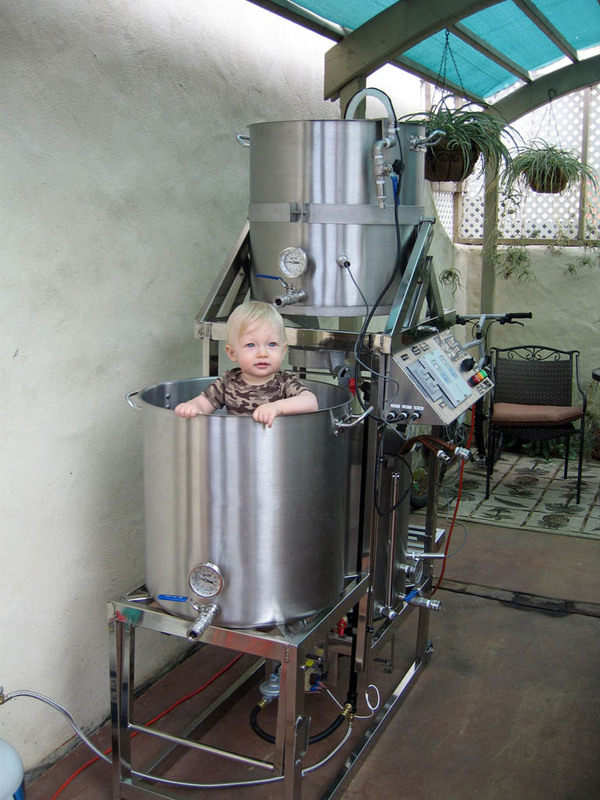 The MoreBeer 2050 BrewSculpture was ready ahead of time and it was difficult to wait through the holidays for the opportunity to fire it up. The first of many homebrews, B3 2050 BrewSculpture. As with any upgrade or new location, I anticipated a rough start. I wasn't even sure if the BrewSculpture would fit through the doorway since specs slightly exceeded the width of our garage door. I decided that I would test and scrub everything on one day before committing to a brew day. Luckily, it fit through the door and was moderately manageable to move the stand to my existing brewing location. With the kettles and everything loaded, the weight is insane. Just the stand, moving around is quite easy. Notes: Pale Ale, such an under appreciated style these days. Especially in San Diego, where I like to tell people that IPA flows out of drinking fountains, pale ale just sounds ordinary. As one of my favorite beers styles, I haven't brewed a pale ale in such a long time. I wanted to brew a great first beer on the new MoreBeer B2050 BrewSculpture and pale ale was very appropriate. Suprisingly, the brew day went very smooth. Over a decade of homebrewing enabled a fairly easy transition. Hops at 0 minutes were used in a Hop Rocket. Nugget and part of the Cascade hops were homegrown by Travis. Centennial from my farm. There were a few minor hiccups during the first brew but nothing that hindered the bulk of the process. I was having way too much fun to really care about the details. The second batch had to wait a few weeks but by then all the kinks were worked out. Getting ready to heat up the mash liquor. California Common was next on the homebrew list. An observer on this day would have probably noted that it would have appeared that I had been using this system for years. Everything went extremely well. I don't even think we spilled any grain during the tippy clean-up. Clean-up is a bit more involved than before but luckily Kara helped out both brews. After this batch, I'm ready to ramp up the production if needed for sheer quantity and experimentation. Notes: This time of year, from a combination of old plaster walls and wood floors, the house fermentation area maintains a consistent 58-60°F. Too cold for ales and too warm for lagers but close enough for a hybrid yeast strain such as White Labs WLP810 San Francisco Lager to thrive. Recipe formulation started with Jamil's recipe shared during his Brewing Network podcast on brewing California Common. Time for some Radical Brewing! When Bryan came to visit us from Oahu I asked him to bring an interesting and wild Hawaiian ingredient. 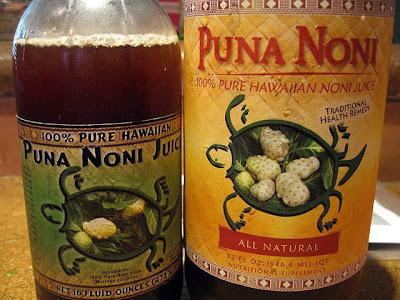 Noni juice is what arrived. The noni fruit is loaded with carbs, dietary fiber, and a host of other micronutrients and phytochemicals. The Puna Noni juice label describes the product as a nutrient supplement with a suggested daily dose of about 1oz (should be about an ounce per serving of beer in the final product). Searching the web, you can find several noni homeopathic applications none of which have been thoroughly investigated. From urinary tract infections to cancer inhibitors, noni juice seems to have a number of health benefits. This beer might be the cure you're looking for! Apparently, the juice is already fermented prior to bottling so there might already be some interesting critters in the juice. This would also explain why I didn't see a jump in OG after adding the juice. For better or worse, I applied the juice after the boil so as not to disrupt the funkiness already present in this concoction. This has got to be radical brewing, right Randy Mosher? This fruit develops a strong odor as it ripens that give it nicknames like "cheese fruit" and "vomit fruit". You'd never think that this species is in the coffee family! According to the noni Wikipedia article, people will only eat this fruit during times of famine. Well, let's see how it does in a homebrew. Should be an interesting experiment and I have several glass carboys that are screaming for long-term projects. Description: The noni juice is dark brown and very aromatic. The flavor and aroma are hard to describe since I haven't had anything like this before. Definitely funky! Should put most recipes found in "Radical Brewing" in the tame category. I'll categorize this brew in BJCP Category 23 - Specialty Brew for its unusual and exotic fermented fruit ingredient and no definitive baseline style. Notes: Added noni juice directly to the primary just before pitching WLP565. Saison I yeast was choosen for its known ability as an underachiever leaving food behind for the sour blend to do its work. 60 seconds of oxygen via diffusion stone also applied prior to pitching. No yeast starter used, single vial only. Started ferment at 65°F and insulated well to allow free-rise. I will not ramp up the temperature like most saison fermentation profiles. Instead, I will let 565 do what it can before racking to secondary and pitching two vials of WLP655 Belgian Sour Mix I. Then, it will sit for a year. Rodríguez, Wilfredo. Noni Fruit (Morinda Citrifolia).jpg. 2008. Photograph. Morinda Citrifolia. Wikipedia.org, 15 Oct. 2008. Web. 21 Dec. 2011. . This is my first writings about working with Hawaiian passion fruit but this is the third brew working with the fruit. I also made a semi-sweet mead with lilikoi juice on national mead day this past August. The lilikoi fruit is sourced from a great friend's backyard on Oahu. Lilikoi is the Hawaiian word for passion fruit. He crushes and strains the juice. The juice looks like an intense orange juice. The aroma is amazing and the flavor is very tart, citrusy, and tropical. Huge props to Bryan who readily processes and ships this across the pond. This past summer, I brewed a similar batch to this one as well as a Belgian Wit. Personally, I think it does very well in an American Wheat but others at my homebrew club liked the wit better. While the wit was more tart, I feel the fruit flavor and aromas were in better marriage with the malt and yeast profile in the American Wheat I brewed. Part of me also thinks that beer fans are also more partial to any Belgian style over a style like American Wheat which can have a bad reputation as a "blonde ale". SMART is a method of maintaining or raising the temperature of your Mash. SMART stands for Step Mash Adjusted Recirculation Temperature. While the acronym is a bit of a stretch, it is a smart way of adjusting your Mash temperature without the concerns of scorching that can be associated with applying direct flame or use electric heating elements. The way it works: By using a pump, you move liquid wort out the bottom of the Mash Tun through a heat exchanger (a copper coil) located in your Hot Liquor Tank and then gently return it to the top of the grain bed. This heat exchange is very gentle and will not have any caramelizing effects on the wort. Another advantage of SMART systems is wort clarity. When you are doing recirculation you are using the grain bed as a filter to remove particulate from the recirculating wort. This allows you to transfer already cleared wort into the Boil Kettle. 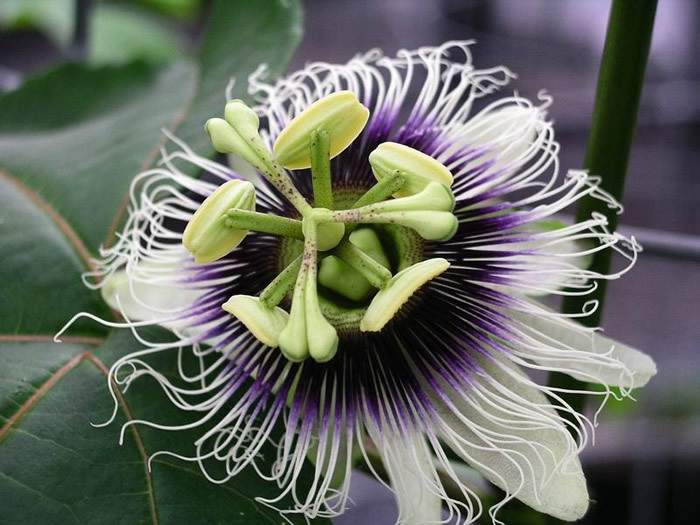 Passiflora edulis, the flower of lilikoi. Description: Bryan shipped a gallon of fresh lilikoi from his backyard. He crushed and lightly pasteurized the fruit. This batch is not as intensely aromatic and flavorful as the last two arrivals. Another good friend, ALF, says the acidity is so high that pasteurization is not necessary. I typically do a 70/30% grist ratio with my American Wheat recipes but stepped this up a bit in the pale malt along with a slightly higher mash temp to cut just a bit off the tart. This is the 3rd homebrew using Lilikoi juice and I also have a mead in progress as well. In my opinion, this is an outstanding fruit to work with for its aromatics, flavor, tartness, and hue contribution (a saturated orange juice color). Notes: At kegging, it was determined by Michelle (my senses were ruined by a recent cold) to add more lilikoi juice to increase aromatics, flavor, and tartness. 1/2 pint of juice was added directly to the keg. No secondary fermentation, went straight to keg. White Labs WLP001 used directly from vial, no starter. By the look at the bottom of the primary after racking, the yeast bed looked very frothy white and healthy. Certainly cleaner than most yeast beds after primary though could be due to lower trub amounts in primary. Lilikoi Juice likely added sugar content that contributes to the OG. It also changes the pH at each addition. If this beer is remotely the hit it was when served at Andrew's engagement party, should prove to be a solid performer at our Annual New Year's Big Bear Bash. MoreBeer! "Analog S.M.A.R.T | MoreBeer." Beer Making Kits and Home Brewing Supplies | MoreBeer. MoreBeer! Web. 18 Dec. 2011. Passiflora Edulis Forma Flavicarpa. Photograph. Passiflora Edulis Forma Flavicarpa. By Agricultural Research Service, USDA. Wikipedia,org, 13 Aug. 2006. Web. 18 Dec. 2011. .